What is Gum Disease/Periodontitis + Why do I suffer? Periodontitis is the name given to a disease that affects the supporting structures of the teeth - the gums, periodontal ligament and jaw bone. It is sometimes called periodontal disease or gum disease. It is important because without healthy gums, the teeth will not be fully supported and may eventually become loose. Periodontitis is caused by the action of plaque, which is a film of bacteria which builds up on teeth. If the plaque is not removed then toxins produced by the bacteria cause inflammation of the gums. 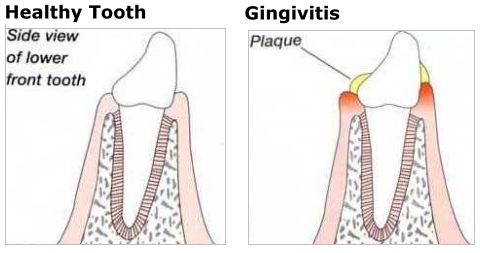 This first stage of the disease is called gingivitis. 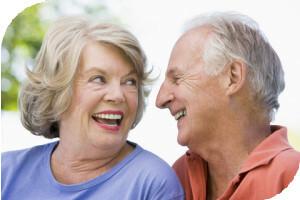 Periodontal disease can sometimes go unnoticed until it is quite advanced. However most people will notice the main signs, which are gums that are red, swollen and bleeding. How does periodontitis get worse? If the plaque is not removed, inflammation spreads down below gum level and plaque forms on the root surface below the gum. This process usually occurs slowly without causing pain. The damage caused to the supporting structures of the tooth leads to the formation of gaps around the teeth - periodontal pockets. At this stage of the disease, when bone destruction has started to take place around the tooth, it is called periodontitis. As more bone is destroyed, the tooth begins to loosen. Why do I suffer more than other people? Periodontitis affects some people more than others. It is estimated that about 10% of people are particularly susceptible to it, about 80% of people may get it depending on their particular oral health and about 10% of people are resistant to it. Poor oral hygiene i.e. not brushing the teeth and gums thoroughly enough. (Some people will need to brush more thoroughly than others to prevent periodontitis - depending on their own susceptibility). Because periodontitis has no one specific cause, the progress of the disease is difficult to predict. The best way to prevent periodontitis is to improve on any of the risk factors above that you can identify as being a problem. Your dentist will be able to help you identify your risk factors. If you have any questions, please do not hesitate to ask the dentist/hygienist. What is my role as a patient in Periodontitis? I have been told that I have periodontitis, what now? Once it has been established that you have periodontitis, you need to make a commitment to help cure the disease alongside your dentist. 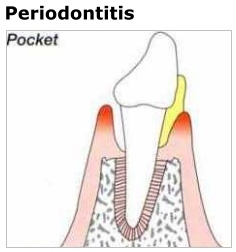 Periodontitis is not like a normal infection that just needs the correct medicine from the doctor. The complex nature of the disease means that several different treatments are needed. Some of these treatments need to be carried out by the dentist/hygienist. Others need to be carried out by you - the patient. In fact, your own part of the treatment is the most important and may mean a major change in personal behaviour. What is the dentists' role in periodontitis? Your dentist will give you information and advice about how to minimise the personal risk factors that make you susceptible to periodontitis. In partnership with the hygienist, the dentist will design a treatment plan of scaling and deep cleaning around the teeth. This will remove the plaque and calculus (hard plaque) so that healing can occur. The scaling and deep cleaning is time consuming but is vital for the success of treatment. Local anaesthetic in the form of injections or gel is available during the treatment if required. What is my role as a patient? The patients' role is the most important in the treatment of periodontitis because without it the dentist/hygienist treatment will always fail. Smoking has been proven to make periodontitis worse. To prevent the adverse affects, smoking must be stopped completely, not just cut down. Research has shown that you stand the best chance of giving up if you attend a recognised stop-smoking course such as organised through your doctors surgery. Advice about local stop-smoking clinics is available from your dentist. Stress affects the immune response to plaque so that the disease becomes worse. Stress is difficult to avoid in modern life but there are ways you can improve how you cope with stress. Many people find regular exercise or a particular hobby good ways to relax and de-stress. Evidence suggests that not eating a well-balanced diet containing enough fresh fruit and vegetables may make periodontitis worse. It is important that the body has a good supply of vitamins, minerals and antioxidants. The care that you give your teeth and gums by thorough, regular tooth brushing is vital to fight periodontitis. If you can clean all the plaque from around all the teeth every day then this will prevent the progress of the disease. The most important areas to clean are where the plaque builds up most - especially in between the teeth. Therefore, the special "inter-dental" brushes for cleaning between the teeth must be used thoroughly every day (ask your dentist/hygienist about these brushes). Signs of success in treating periodontitis are when the gums no longer bleed and when they tighten up around the teeth, looking pink and firm. Periodontitis is not a disease that you can treat and then forget about however and success means maintaining your preventive care regime for life. This means regular appointments with the dentist and hygienist as well as continued personal oral hygiene. Following these simple rules should allow you to keep your teeth for life!